CONDITIONS: Cool 15-17deg; wind from all directions; but mainly dry. Where were the riders; or ducks? With the field reduced by half, mostly due to the threat of some pretty ordinary weather conditions,, the finishers all seemed pleased with themselves; justifiably. First man off and first home was young Oscar Barratt. And he's now completed a hat-trick of PBs on the one-lapper. Quite clearly though, it wasn't a day best suited for PBs - there was only one other: Steve Oates. Steve's is his second in three rides on the course and he's heading rapidly to a place in the 40km/h club. The wind was all over the place - it was one day when the perennial complaint of cyclists that there was a headwind all the way, was more or less true. It started off from the NW and was a brisk SW when the last few riders finished; it had moved through at least 270 degrees. But apart from the wind, the conditions were OK and there was even blue sky at times; riders stayed pretty dry but it may have been good that the field was so drastically reduced as the skies opened with a vengeance soon after we had finished packing up. Thomas was the first 4-lapper home and held top spot throughout. About half a lap behind him which is about where he started, having jumped up the list to fill one of the many gaps, was second man home, Colin Rose and he claimed and held onto the number one Standards rank - Thomas was finally displaced when last man off, Allister Caird, stormed home. Deb Kempe had also jumped up the start list (over half the field had a variation to their start time today) and she was first woman home and held that place throughout. This was the third event where NPS points have been on offer and once more there was a rearrangement of the rankings: Today belonged to Andrew Bannister but Richard was tucked in not too far away and there are still another three opportunities to improve their 'best three' scores - for each of the group. It was Neil's 100th ATTA ride too! Because of all the start time changes there were some pretty impressive Lap1 times - until we could do all the corrections. Cathi Dixon, who was assisting Lorraine at the start, even had to go touting for customers to arrange on the line - the gaps were so large. David and Carolyn Equid were also kept busy on the desk, shuffling riders. In fact a smaller field doesn't give the helpers any real respite. 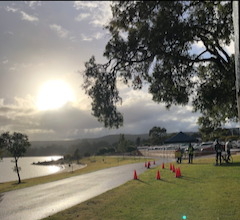 In the hour or so before Huey turned the lights on, Troy (and company) set up three shelters from the anticipated rain before signing the rest of the course and manning the exit before packing it all back into the trailer. Once we got started, Craig Beeching was looking after the deep South and Paul van der Walt was keeping the score for the back-up timing. Jeff was the man on the bridge. And Amos kept us all happy with hot beverages. Jeff organised the helpers list as he's done for quite a while now but that's coming to an end - Jeff needs a break; we need a replacement for Jeff - and a steady stream of helpers through winter and next season. Please keep that in mind when you decide you too need a break and don't need to ride.